Summer means it's time to break out the popsicles, sunscreen, and backyard pool. Whether you blow up a kiddie pool, or make an Olympic-sized enhancement to your backyard, swimming pools pose a risk at any size. According to the Centers for Disease Control and Prevention, there are approximately 7.4 million swimming pools in homes, backyards, or public areas across the country. With water activities being one of the most popular ways to stay cool in the summer, it's no wonder kids flock to that attractive blue water from dawn to dusk. However, there are over 3,400 unintentional fatal drownings each year in the country, and one in five of those involves a child under the age of 14. If you own a pool, or set one up for kids to play in your backyard, you are opening yourself and your home up to a mountain of liability. To protect yourself and your family against devastating loss and financial turmoil, keep in mind a few simple pool safety rules before jumping into the deep end. 1.Before allowing any and all children into your backyard to swim, ask them if they know how to swim and have them demonstrate. A good swimmer should accompany learners, and no one should swim alone. 2.Check your local requirements on what constitutes a "pool" and what local safety standards or codes you must adhere to by the law. This may include a fence, or keeping necessary safety equipment on hand. 3.Check with your insurance company to see if you may need additional liability coverage and to cover the pool itself in the event of storms or damage. 4.Educate your family and your children on what to do in case of an emergency when they are swimming with their friends. 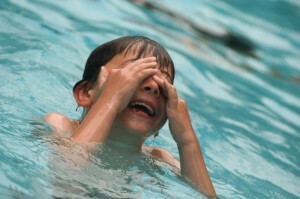 5.Never leave small children unsupervised, and keep toys or floats out of the pool when they are not in use. 6.Know who is in the pool at all times, do not allow children into your pool without talking to their parents and understanding the skill levels or special needs of all swimmers. 7.Keep children away from pool filters and other mechanical devices as the suction force may injure them or prevent them from surfacing. Understand and practice shutting off these devices in case of an emergency. 8.Do not mix swimming with alcohol use. According to the CDC, alcohol use is involved in up to half of adolescent and adult deaths associated with water recreation. 9.Keep all necessary emergency equipment near the pool including ring buoys, a first aid kit, and reaching poles. 10.Take the time for you and other members of your family to complete a CPR training course offered by the American Red Cross so you are ready in case of an emergency.